"Optimal Task Assignments with Loss-Averse Agents" by Felipe Balmaceda, Assoc Prof. 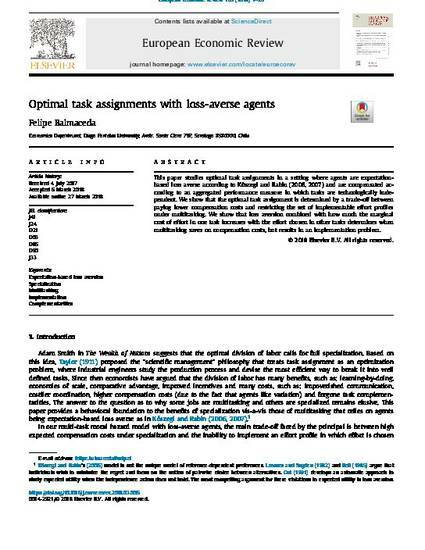 This paper studies optimal task assignments in a setting where agents are expectation-based loss averse according to KoszegiRabin (2006) and KoszegiRabin (2007) and compensated according to an aggregated performance measure in which tasks are technologically independent. The principal faces a trade-off between paying lower compensation costs by making an agent responsible for all tasks (i.e., multitasking) and restricting the set of implementable effort profiles, and paying higher expected compensation costs by allocating each task to a different agent (i.e., specialization) and being able to implement any feasible effort profile. In the absence of loss aversion, multitasking always dominates specialization, while in the presence of loss aversion, multitasking always dominates specialization when the degree of loss aversion is sufficiently large. Otherwise, specilization can dominate multitasking. It is the implementation problem created by loss aversion, and not the risk aversion feature of loss aversion, that drives our results.